Following extensive assessment by our materials specialist, plus examining feedback and comment from users, the Institute of Chiropodists and Podiatrists are happy to recommend these socks as quality products from a dependable and responsible company. 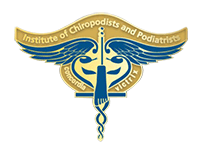 The Institute of Chiropodists and Podiatrists (IOCP) is a professional body that serves practitioners throughout the whole of the profession of podiatry and podiatric medicine. Its members include chiropodists, podiatrists and podiatric surgeons, within the NHS and/or private practice. Being granted the Institute certificate of membership is proof that such practitioners undertake to adhere to a strict code of ethics and the highest standards of professional conduct. Members and their clients are protected by what is recognised as the UK podiatry’s most wide-ranging professional indemnity insurance and an exemplary range of academic support. The Institute is a democratic organisation with the election of officers both local and national being decided annually by its members. All members therefore play an active role in their own affairs. The Institute believes a self-governing body should follow an independent line for the progress and well-being of both the profession and the public it serves. HJ Hall are proud to be associated with the IOCP and have their endorsement on the Softop® ranges and HJ Hall Diabetic Socks.